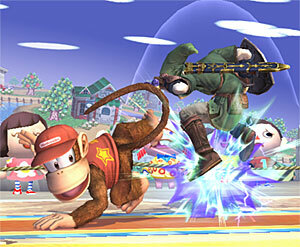 March 3, 2008 - As we all know, the Super Smash Bros. series is all about the characters. And Brawl will definitely not disappoint in this department. With over twenty characters available immediately and fourteen secret characters, you'll have plenty of fun with both the new and returning characters. Check out our list below of all the standard characters that will be available right from the beginning of the game. And if you're not afraid of a few spoilers, click on our list of unlockable characters! Surprisingly, everyone's favorite Mario bad guy has not always been a part of the Smash Bros. character roster. The big lizard-dino guy made his debut in the GameCube's Super Smash Bros. Melee, and was an instant fan favorite. He wasn't the fastest or most limber character, but he had a huge fireball that could incinerate everything in its path. And that made him tons of fun. 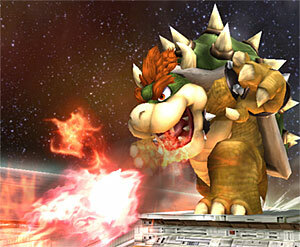 In Brawl, Bowser will still have his trademark fireball move, but he will also be a little faster and less clunky than he was in Melee. Donkey Kong's famous little nephew and number one sidekick makes his first appearance in a Smash Bros. game in this year's itineration. But don't think that Donkey Kong's little buddy can't hold his own. On the contrary, Diddy wields a pair of peanut popguns and is also set to do his trademark move from Donkey Kong 64, the rocketbarrel boost! Here we have another veteran of the Smash Bros. series. 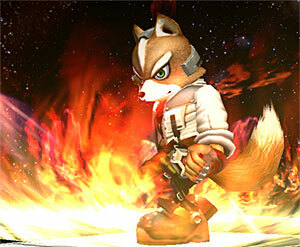 Fox has been with the series since the beginning and is definitely a fun character to play with. He has received a little bit of an update since Melee. He has a brand new outfit to show off and a new reflector shield that can reflect any attack back to the enemy. In addition to his new outfit and shield, Fox will also have a redesigned blaster. So if you're looking for the same old Fox, you may have to look elsewhere, because this one's going to be all new! 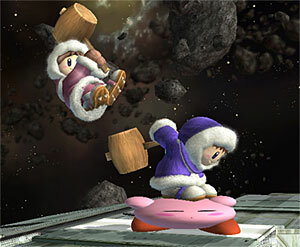 The Ice Climbers came on the scene in Super Smash Bros. Melee, and were unexpectedly popular. These two characters came from the NES launch title Ice Climbers, which featured several stages that challenged you to climb up several icy stages fraught with peril. These two companions both have big hammers and make quick work of double-teaming the enemy.